Dental implants represent the absolute best method available for securing crowns, bridges, and dentures in the replacement of missing teeth. When these tiny titanium posts are surgically embedded in the jaw, they integrate with the bone, essentially becoming part of the patient’s natural anatomy. Certainly, the body does not distinguish between dental implants and natural tooth roots, which is why dental implant surgery has one of the highest success rates of any implant surgery. The vast majority of implant dentistry patients emerge with their oral health and function, not to mention their smiles and self-confidence, completely restored. Although the success rate of dental implant surgery is high, it is still a major, invasive surgical procedure that requires a significant recovery period. During this recovery period, it is extremely important that patients follow the post-operative instructions with which they are provided to the absolute letter in order to ensure their own health and the best results possible. When meeting with patients to discuss dental implants at his practice serving Rancho Mirage, CA, Palm Springs, CA, and Palm Desert, CA, Dr. Bruno Lemay explains the dental implant surgery recovery process in detail so that they know precisely what to expect before committing to the procedure. Are you a good candidate for dental implants? To learn more about dental implants, including the recovery process after surgery, contact Desert Dental Alternatives today. 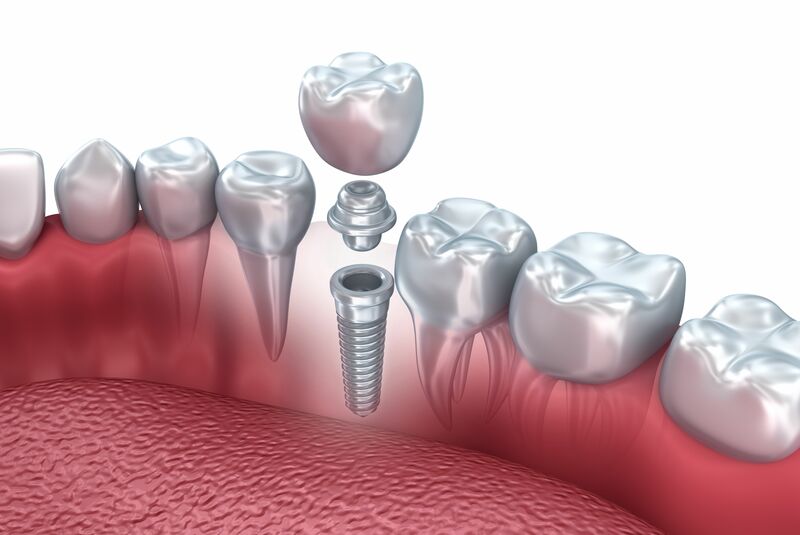 What Is the Dental Implant Surgery Recovery Process Like? You must arrange to have someone drive you home from your surgical appointment because you will be unable to drive yourself. You may want to have someone on hand around the house to help out for a day or two as well so that you can simply rest and stay off your feet as much as possible. Immediately after your surgery, a gauze pack will be placed over the surgical sites. This should not be changed until bleeding is controlled, at which point it can be changed every 30 to 45 minutes for the first 24 hours after surgery. Be careful not to rinse, spit, or otherwise poke at the surgical sites during this time. You should brush your teeth, but very gently. After 24 hours has passed, you may begin using the oral rinse that Dr. Lemay has prescribed to you, precisely as recommended. You may augment this with a warm saltwater rinse to rid your mouth of food particles after each meal, before gentle brushing. Initially, you should limit yourself to soft foods; however, you may resume your normal diet as soon as your mouth has healed sufficiently. Be sure to take all medications exactly as prescribed by Dr. Lemay. This includes your prescription oral rinse and your antibiotics. The latter will help to prevent infection at the surgical sites. If you experience any pain, an over-the-counter pain reliever can be taken, and swelling can be reduced by using an ice pack. Strenuous activity should be avoided for at least four days after surgery, while smoking should be avoided until the mouth has fully healed. Preferably, if you are a smoker, you will use this opportunity to quit, as smoking promotes gum disease, which in turn could cause your implants to fail. Osseointegration, the process in which the bone and titanium implant fuse together, generally takes between three and six months, at which point the abutment that will hold the dental restoration in place will be affixed to its top. To learn more about recovering from dental implant surgery, please contact Desert Dental Alternatives today.